India is located on the largest Asian peninsula Indostan. A larger part of India is occupied by the highest mountains on Earth – the Himalayas. With the exception of the mountains and the desert regions in India dominates the monsoon climate. In Northeastern India is located the town of Cherrapunji – the wettest place on Earth – the average annual precipitation here reaches 12,000 mm. The so called Northern plains spread south of the Himalayas. The biggest Indian river – the Ganges – rises in the Himalayas and cuts into the plain. It irrigates ¼ of the territory of India. The Ganges Valley is the most densely populated place in the country. The exact opposite of the Ganges Valley is the Thar arid sandy desert. More than 1 mln camels provide the basic transport in the arid desert regions of the country. Typical for the country are the evergreen tropical forests in the delta of the Ganges. India’s agriculture is undeveloped and primitive. Most of the activities – irrigation, manuring, have been done in the traditional way for centuries. India is one of the largest producers of sugar cane, tea, tobacco, etc. in the world. India has the largest rice fields in the world. It is a world producer of a number of spices – black pepper, nutmeg, ginger, cinnamon, vanilla, clove, etc. In India the cow is considered a sacred animal and according to the Hindu religion only the milk can be used from it. The textile industry is well developed. Although an agrarian country, India is highly urbanised – more than 250 mln people live in the cities. Today’s lands of India were settled by people in the remote past. The amalgamation of the numerous invaders and settlers with the local population brought about an incredible assortment of crops. It is deemed that every person belongs by birth to a certain caste, which determines his or her social status – profession and job, social circle of communication, choice of marital partner, etc. It was a colonial dominion of Great Britain, and in 1947 the country became independent. In 1949 it adopted the Constitution, which is effective even today. The country comprises 28 states and is the largest democratic republic in the world. India has one of the largest armies in the world. The Victoria Station in Mumbai, one of the largest cities in the world, was built in the place where the first railway line in Asia had been constructed and made operational in 1853. Dal Lake in Kashmir is famous for its pictruresque location, the beautiful lotuses and the wooden boat-houses, where the people of Kashmir live and grow sailing gardens. 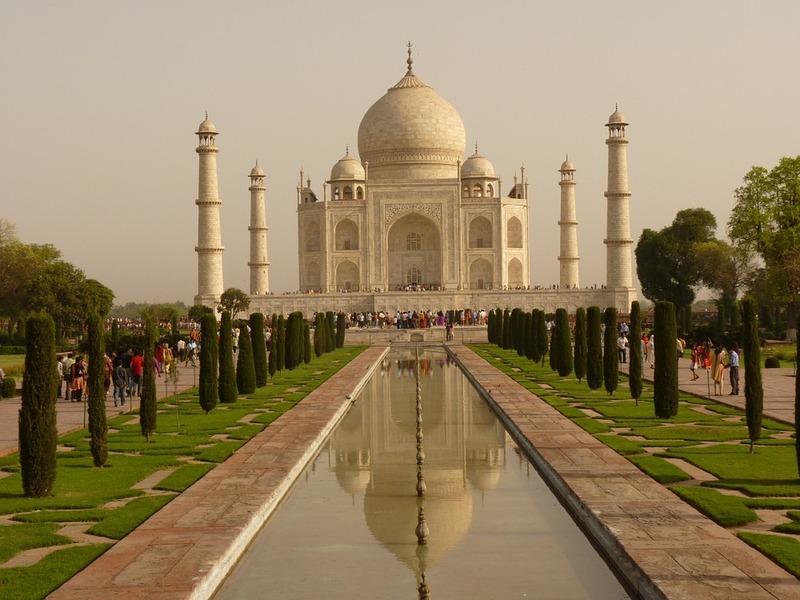 The Taj Mahal mausoleaum, located on the Yamuna River, is one of the most magnificent buildings in the world. Shah Jahan, who ruled the Empire of the Great Mughals from 1628 to 1658, built the Mausoleum for his beloved wife Mumtaz Mahal, and later he was buried there too. Sari is the traditional outer clothing of the Indian woman. Usually it is a brightly coloured fabric, most often with an interwoven golden thread, whose one end is wrapped around the thighs like a needle, and the other end is put on the shoulders or on the head like a scarf.